In my own personal ups and downs to hit InboxZero every day, I find that the silly tool that helps me the most is having a keystroke to move the current email into an Archive folder. 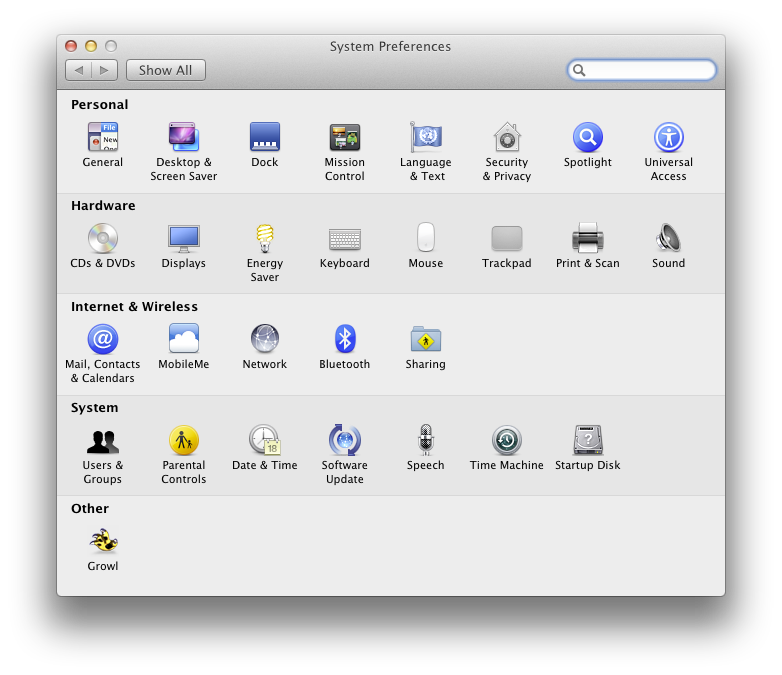 First, open up System Preferences. Next, go into the Keyboard PrefPane. Select the Keyboard Shortcuts tab near the top. Now select Application Shortcuts in the left column, and then click the '+' sign at the bottom of the right-hand column to add a new application keyboard shortcut. In the top drop down box, choose Mail. There are two things to notice: first, there’s no shortcut listed on the right-hand side, and second, the menu item text we need is simply Archive. So now we’ll go back to the Keyboard PrefPane and type that into the Menu Title text box. 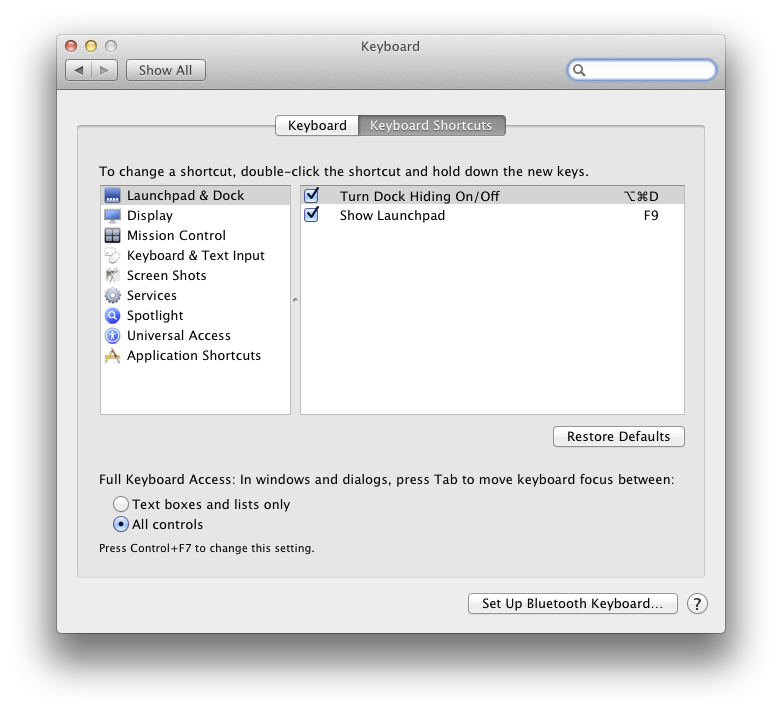 Next click into the Keyboard Shortcut text box and type in your preferred shortcut key. I used Ctrl + A, which is displayed as ^A. Finally, switch back to Mail.app and check out the Messages menu again. 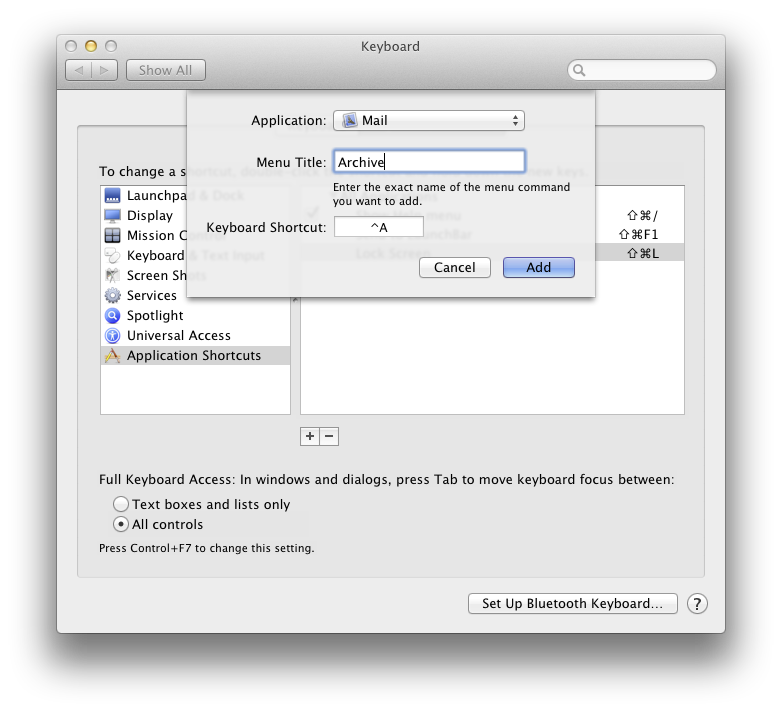 The Archive menu item now shows your keyboard shortcut key on the right hand side. 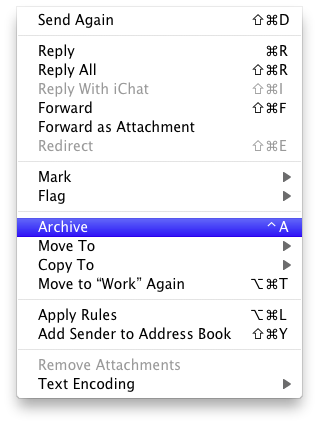 Now take it for a test drive: select an email you’d like to archive and then hit your shortcut (^A for me). You should see your email safely disappear into your Archive folder. And for bonus points, if you have more than one email account, select two emails sent to different accounts. When you hit your shortcut key to archive them, each will go to the correct account’s Archive folder. Booyah! With that set, I can fly through my Inbox deleting and archiving as fast as possible, leaving behind only the emails that I really have to think about and extract meaning from. Processing email on my iPhone is just a losing battle after having this setup. Now go on. Get going on it. You’ll feel like a ninja.